Lily peeking out of her den at the camera. My latest obsession is watching Lily the black bear. 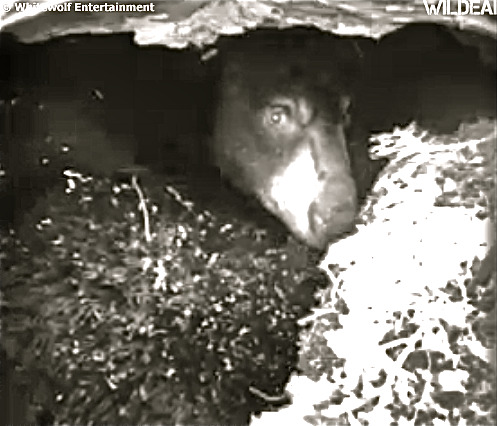 I believe she is the first black bear in the wild to have her own web cam this winter positioned nicely in her little den. She is a 3 year old black research bear from the North American Bear Center (NABC) The NABC is dedicated to educating the public about bears and preserving the beautiful natural habitat of bears around the world. 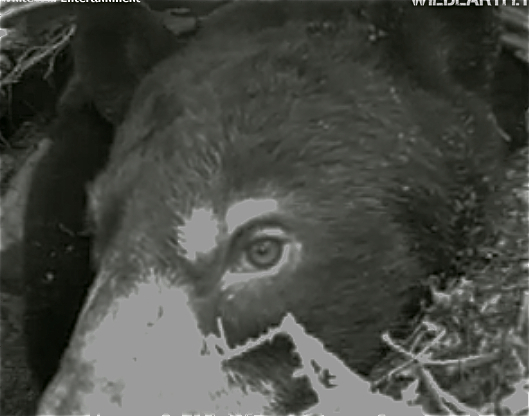 Through a generous donation to the NABC of a $4000 web cam, we are lucky enough to be able to experience firsthand a wild bear in their winter den. What’s even more amazing is that she is most likely going to have cubs ANY day now! It’s unbelievable how many people just like myself have totally fallen for this little lady. She has over 20,000 fans on Facebook todate! Every little movement she makes we all cheer her on in the chat room . There are two places to watch the web cam one is through bear.com and the other is at Wild Earth TV You can also follow along on Facebook “Lily the Black Bear” which is a fun way to interact with other fans. 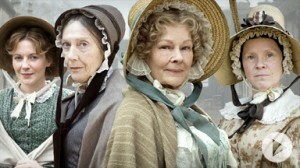 Beware if you do start watching her you might not be able to stop! I’ve read some teachers are even letting their classrooms follow along. I’ve notice that around 9 am PST she seems to be really active. The Facebook page actually has more info about Lily specifically than the website. I was able to get a couple of screenshots of Lily. 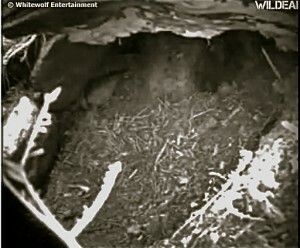 One is of her empty den as she had gotten out to do what we’re not sure. But it sounded like digging or branches kind of breaking. 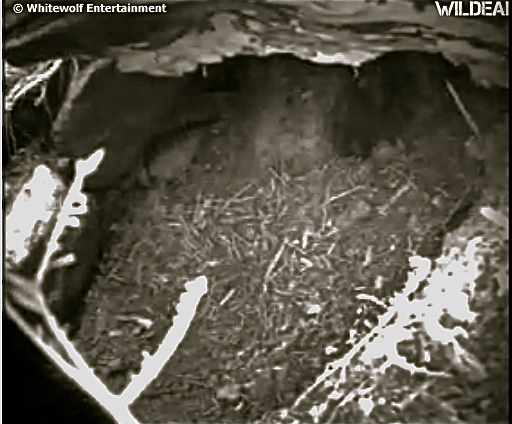 Then she got back into the den and pulled a lot of debris in front of the camera! To which everybody in the chatroom groaned “NOOOOOOOOOOOOO! Lily!” LoL The last I looked it seemed as though she somehow managed to move a little of it so hurray for her we can still see. My assumption is that when those cubs are born it’s going to need to be blocked a little more because they are born tiny and naked. There is a LOT of snow in MN right now too. Brrrr Luckily their mama has a very warm fur coat.